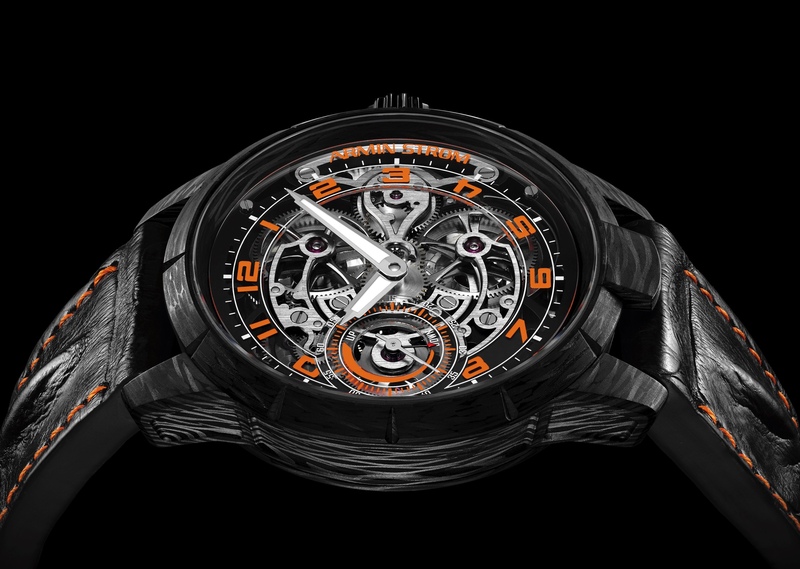 In 1967, Armin Strom started a workshop in the town of Burgdorf which is northwest of Bern. In addition to selling and restoring watches, he subsequently began making hand-engraved and skeletonized timepieces under the “Armin Strom” moniker. Due to his incredible attention to detail and skill with his hands, he earned a very good reputation for hand engraving, a reputation the company still has today. 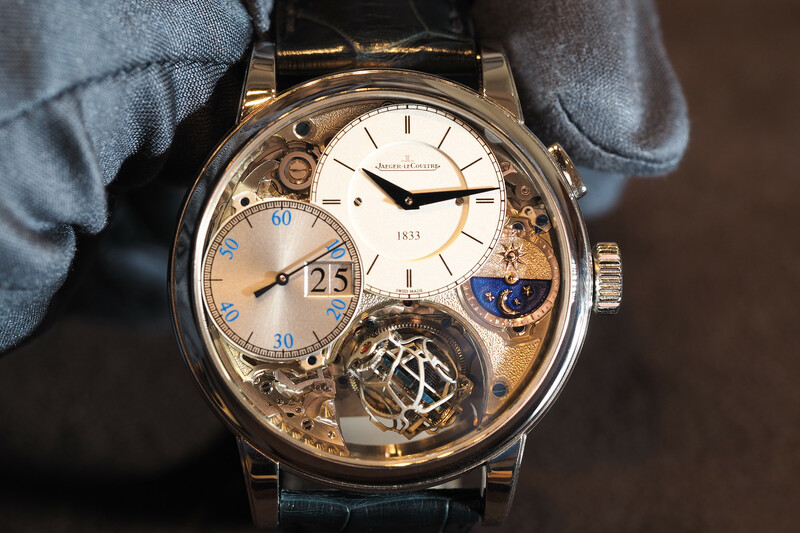 In 2009, Armin Strom AG moved to a larger facility in Biel, and that same year they introduced their first in-house movement (the caliber ARM09). This eventually led to the development of the AMW11 caliber seen in the Manual Earth, the brand’s most affordable watch collection. Armin Strom caliber AMW11 is a manually wound manufacture movement with a number of upgrades from its original iteration. From a readapted gear-train which guarantees higher efficiency, to a newly integrated escapement designed to minimize power loss, to immaculate hand-finishing of the components — no detail of the movement was overlooked — even the rubies have been specially made for Armin Strom. An impressive 7-day power reserve makes you forget this watch is a manual, not an automatic. As a signature and expression of their expertise in engraving, all Armin Strom calibers have some form of hand-engraving. In this case, a mountain range scene has been engraved on one of the bridges. The main components of the movement have been ruthenium coated, which results in the shiny dark grey finish that can be seen through the openwork dial, or through the caseback. The darkened movement perfectly compliments the black case. The brass, which is used for components such as the bridges and plate, has been “thermally relaxed” which is a process that heats the metal over a period of 24 hours to strengthen it after being cut by a CNC machine. The escape wheel and pallets are made of solid gold with hardened functional areas, which increase the efficiency of the distribution of energy. The free sprung balance with gold screws which oscillates at a frequency of 2Hz, and can be adjusted by four clamped steel screws balance screws. An impressive mixture of Fausses Côtes, circular graining and sunburst finishes are used to decorate each movement. There are 112 total components, 20 of which are jewels. The maximum power reserve is 120 hours. 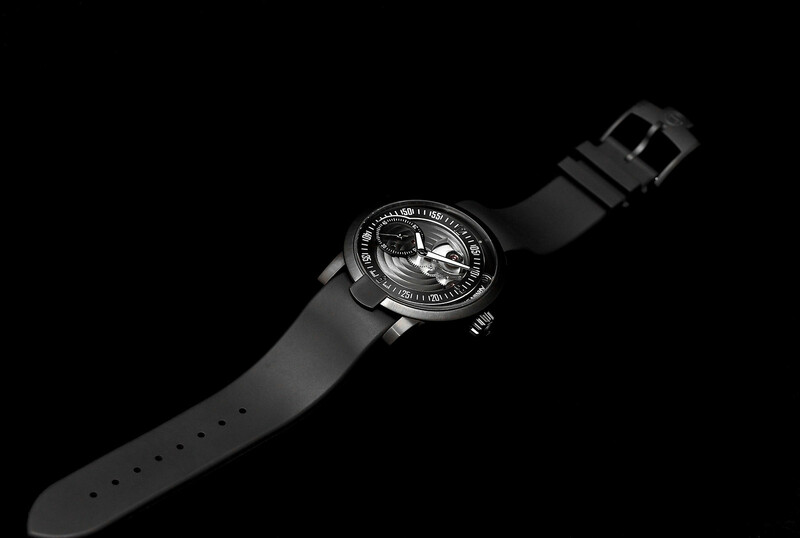 Each case is crafted from stainless steel that has been coated with a black PVD treatment. This not only gives the watch a sporty appearance, it also protects the case from scratches as PVD is much harder than steel. The PVD finish is mostly matte, with subtle polished accents on the bevelled case edges and lugs, and the crown. The case measures 43.5 mm in diameter by 13 mm thick. The lug width is 22 mm. From the dial side to the case back, the case edges are slightly tapered. The designers paid special attention to the proportions of the watch, resulting in a case that is both appealing to look at on the wrist, as well as being comfortable on the wrist. Not to mention the fact that they made the lugs and the articulating strap just right ergonomically. Armin Strom’s signature hour/minute display prominently displays the time, off-center. The openwork design allows you to see right through to the mainplate, and the multi-level construction gives the dial a three-dimensional depth. 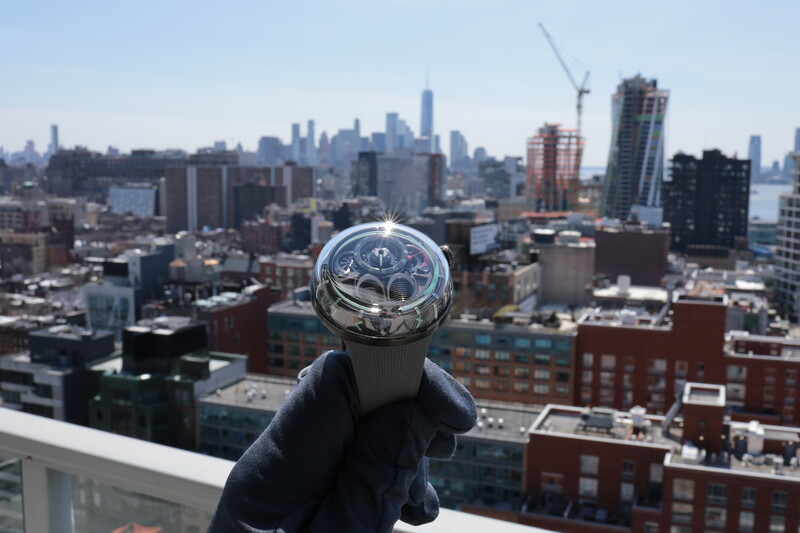 Hours and minutes are displayed via large central hands that are polished to a mirror finish and are treated with a luminous material. Applied polished Arabic numerals indicate 12, 3 and 6 o’clock. However, the other hours are marked by minute indicators, such as ‘05’ for 1 o’clock, ‘10’ for 2 o’clock, and so on. We think this mixture of hours and minute markers looks good, but it does make it a bit harder to read the hour quickly at a glance. This is about the only gripe we have, which is a good thing. A subsidiary dial at 9 o’clock indicates the seconds. A vertical plate with “Armin Strom” printed on it is secured by two screws at 3 o’clock. There is no-date display. The Armin Strom Manual Earth is delivered with two straps: a genuine black alligator horn-back strap and a black rubber strap (pictured). Water-resistance is 50 meters. Limited to 100 pieces, with an individual number from 1 to 100 engraved on a round plaque on the movement side. The Manual collection comes is four variations: Earth (PVD steel), Wind (titanium), Water (steel), and Fire (18K rose gold).